President Trump’s Special Envoy to Syria Joel Rayburn reportedly met Monday in Istanbul with a delegation that included a high-ranking pro-Turkish Syrian rebel leader who endorsed al-Qaida-linked rebels. 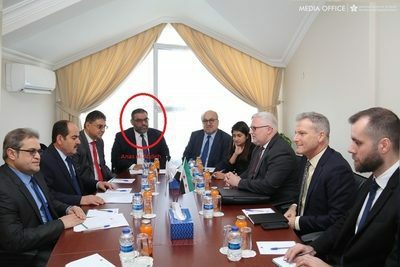 A photo posted by the National Coalition of Syrian Revolution and Opposition Force, known by the Arabic acronym ETILAF, shows the group’s former president, Anas al-Abdeh, attending the meeting. Al-Abdeh is not named in the post, but he appears in the upper left corner of the photo. The State Department did not respond to a request for comment about al-Abdeh’s presence at the meeting. This week’s Istanbul gathering focused on developments in Syria’s Idlib province, a statement on ETILAF’s website said. This meeting otherwise went unreported. Hayat Tahrir al-Sham (HTS), the successor organization to al-Qaida’s former Syrian affiliate, Jabhat al-Nusra, currently controls Idlib. Al-Abdeh opposed the ultimately successful effort by the Kurdish-dominated Syrian Democratic Forces (SDF) to cleanse ISIS from its self-proclaimed capital of Raqqa due to his alignment with the Muslim Brotherhood and Turkey’s ruling Justice and Development Party (AKP). The Obama administration spent $500 million training and equipping Syrian rebels linked with the FSA, but only succeeded in training four or five fighters before President Trump ended the program. FSA forces formed a major portion of Turkey’s invasion force in the Kurdish-dominated Afrin region in northwestern Syria. Since the FSA took control, an extremist interpretation of sharia has been implemented, Yazidis have been forcibly converted to Islam, and some ethnic cleansing already has taken place, Afrin native and current Syrian Democratic Council (SDC) Executive Director Ilham Ahmed said earlier this month during a visit to Washington. The SDC is the civilian political arm of the SDF. Amnesty International, The Syrian Observatory for Human Rights and Human Rights Watch have made similar observations. The FSA has been closely linked with Turkey’s security services since the start of the Syrian Civil War in 2011. Its operations are closely linked with Turkey, which has used it as a proxy against the Kurds. ETILAF announced in December that FSA militias will participate in an anticipated Turkish invasion of SDF-controlled northeastern Syria and effort to create a Turkish-controlled “safe zone” along the Syrian-Turkish border. HTS leader Abu Muhammad al-Joulani also has endorsed participating in the Turkish offensive.